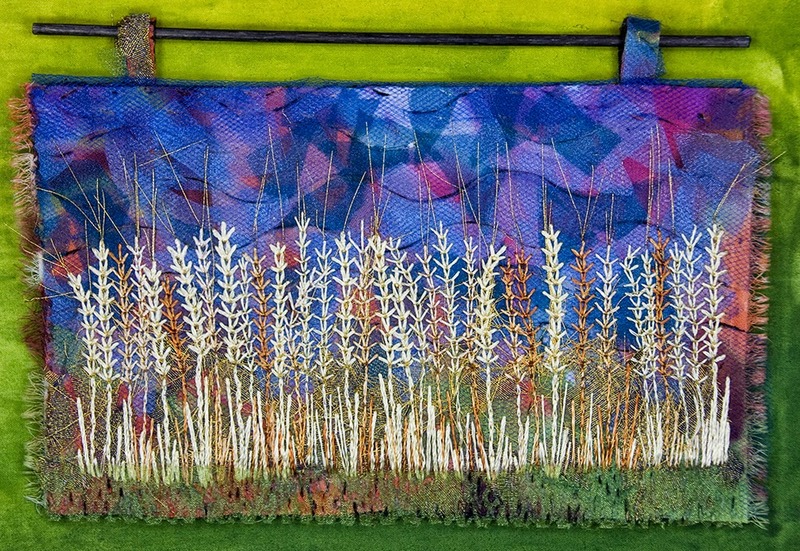 As harvest nears on the prairies I've been stitching wheat lately. 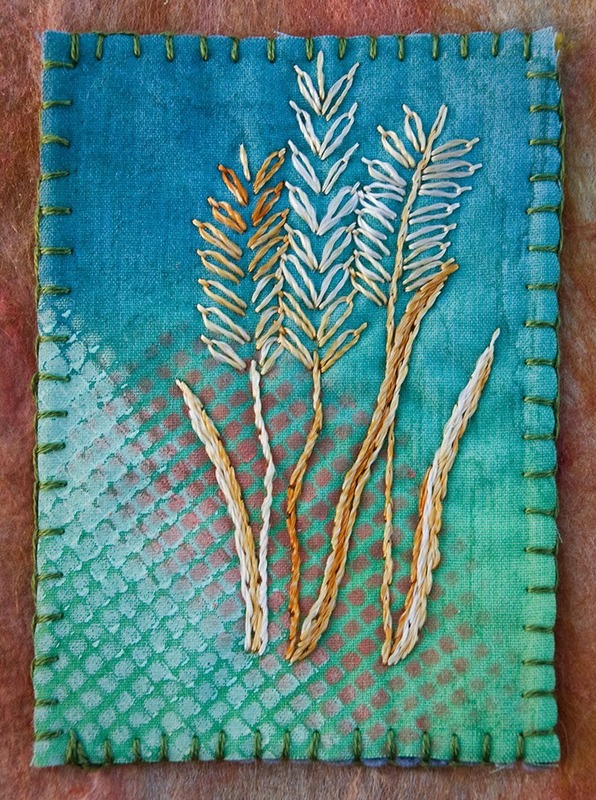 For these wheat kernels I fused a few of layers of organza together and stitched them down on dyed and stamped fabric to make a fabric postcard. 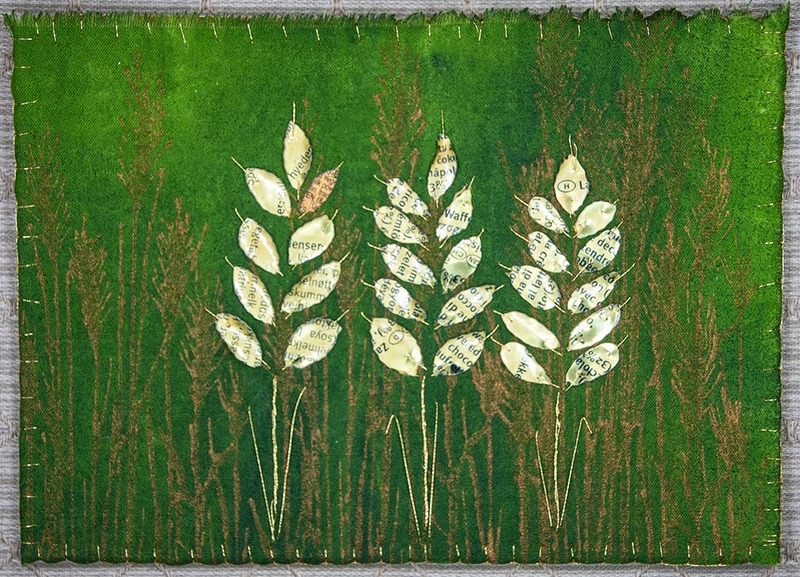 I recycled a granola bar wrapper to make these wheat kernels and again stitched them down on dyed and stamped fabric for another fabric postcard. Playing with organza, I fused snippets of pieces down onto black felt and then stitched a row of wheat using the wheat ear stitch. Lazy daisy stitches for the kernels which I made into an atc. 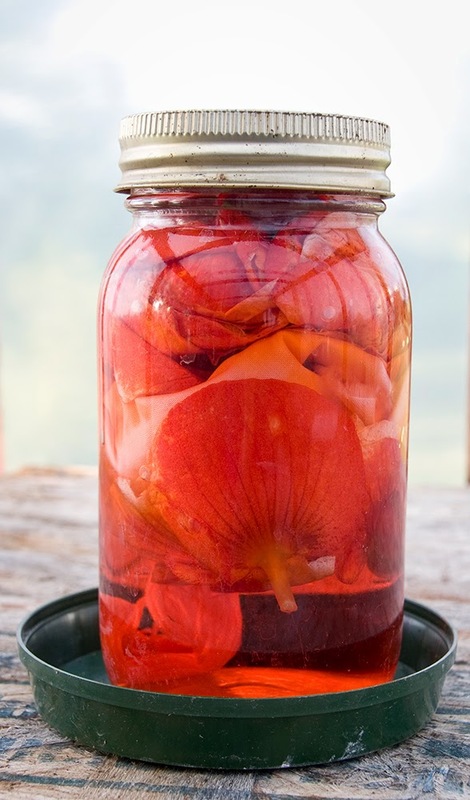 I should have started this in July but here I'm trying my hand at some solar dyeing. I mixed a 1/4 tsp of alum and an 1/8 tsp into this gallon jar which I 1/2 filled with warm water. 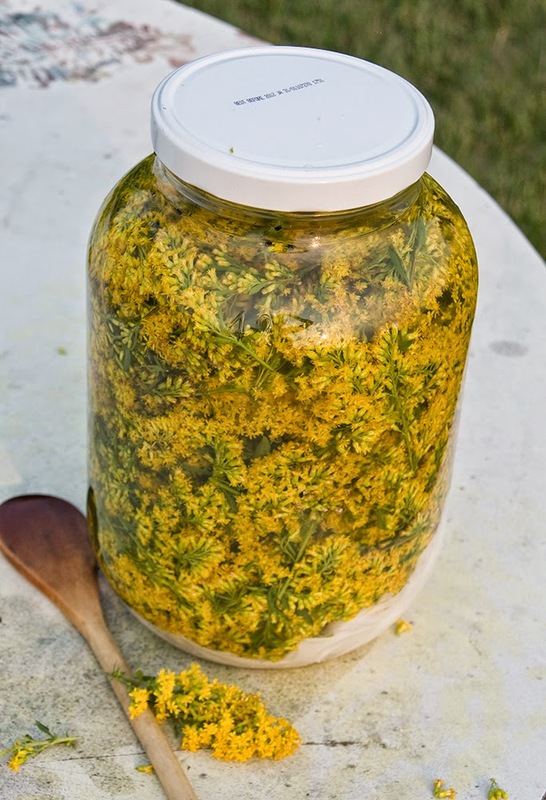 I added a piece of ready to dye cotton and some white DMC thread and filled the jar with wild goldenrod flowers. I then topped it off with some more water. I'm stirring it every day and will see what happens after 10 days. 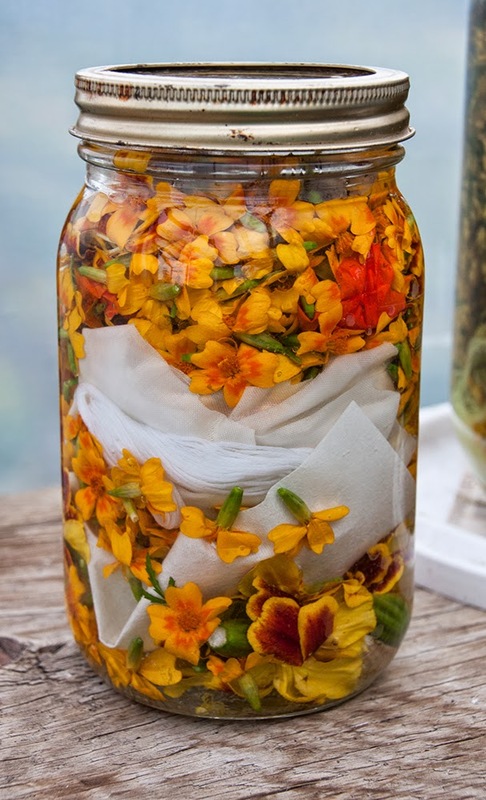 It rained for a couple of days and it's been cool so I might have to wait longer than 10.
and a jar with dahlia flowers. Both have a piece of white cotton fabric and white thread. Just have to wait and see what happens now. I want to see the results of your dyeing! 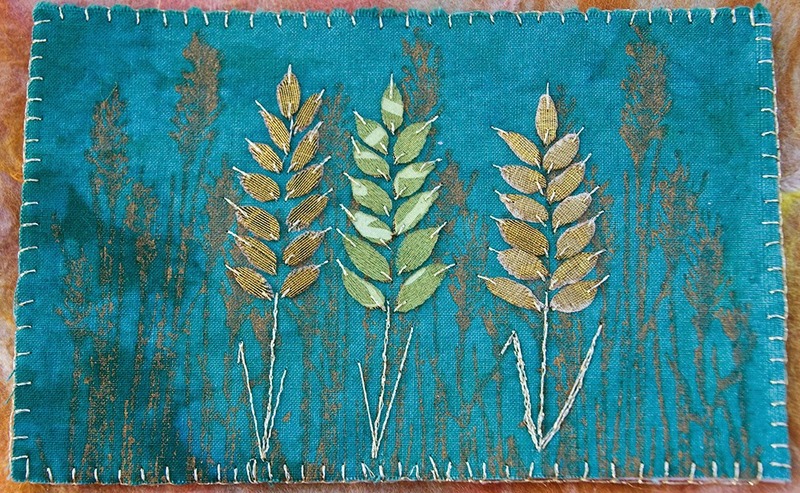 Love your wheat stitching too.